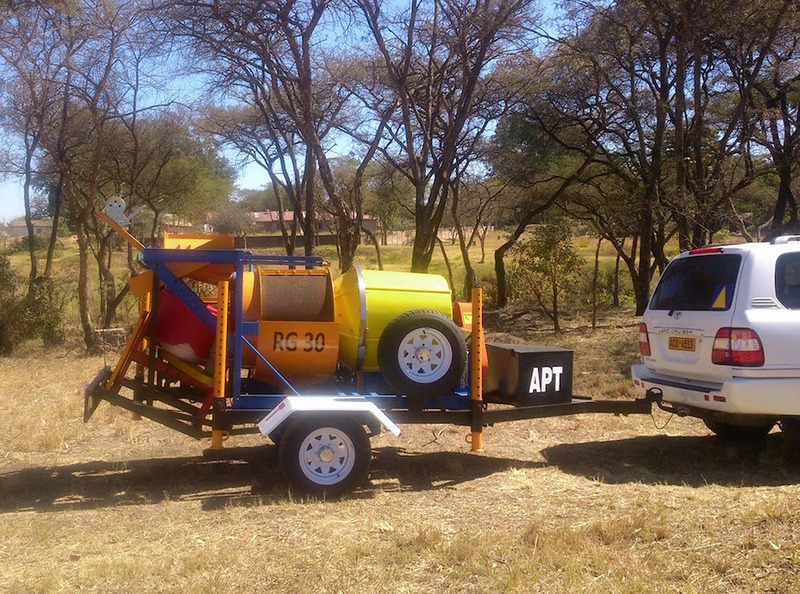 A mobile minerals recovery and exploration system has been launched by APT, with the aim of taking small and medium scale exploration and production to a new level. The RG30-T Production Kit allows optimal mobility by means of a complete mining kit mounted on a rugged trailer, so this is a full mobile minerals recovery plant. The concept behind the mobile solution was driven by the need for reducing the risk and costs involved in the exploration process, while enabling greater production and therefore optimum profit to be made. Furthermore, it enables the operator to anticipate future stumbling blocks in the mining process ahead of feeding to the main plant, by providing the ability to process large bulk samples through to small concentrates. The mobile minerals recovery Exploration and Production Kit combines the RG30 and GoldKacha Mark 4, with GoldKonka upgrader and GoldJigga Field Jig and ancillary equipment, into a robust configuration which fits onto a neatly designed trailer, allowing you to move from resource to resource. The RG30-T is a fully functioning system and does not require interface with other machinery. The process begins at the RG30 scrubber, and the leading features are outlined here. Firstly, the GoldKacha takes larger mass pull to concentrate than competing equipment, therefore a very high primary recovery is achieved. The RG30 also has a deep belly drum together with an integral high efficiency trommel screen, allowing for both clay disintegration and the improvement of gold liberation from host material. The feed from the RG30 scrubber is then passed to the GoldKacha Concentrator via gravity, eliminating the need for additional pumps. Thereafter, the concentrates are fed manually into the GoldKonka Up-Grader which treats the concentrate to smeltable grade. The GoldKonka allows for the finest gold particles to be recovered, eliminating the need for mercury. For larger gold nuggets, the GoldJigga Field Jig is used to enable easy hand-pick recovery of the nuggets. The whole system has a 3tph feed rate. The set-up and put-away time of this module is minimal and takes less than 15 minutes. All access flooring and components fold away neatly and this module comes pre-wired and complete with the necessary water transfer pump and all integrated piping. This plant is part of our GroundBreaker range and is therefore available for purchase through our online store. If you would like testimonials, please see this plant in our products section here on our website. If you would like more information, please contact us with your query. We look forward to hearing from you and wish you success in your mining venture!